Saturday morning was a powder day for skiers and young snow shovelers alike. About four inches of snow fell Friday night in West Ketchum, much to the delight of 9-year-old Brooke Beckwith, left and her 5-year-old brother Blake. 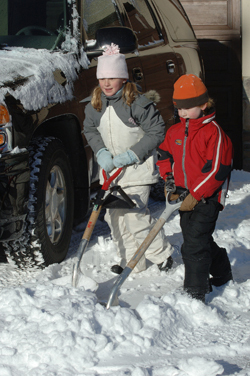 After clearing mom’s driveway, Brooke summed up her enthusiasm by saying, “I love this new snow.” The National Weather Service is forecasting the possibility of snow and frigid temperatures for most of this next week.